Neurotransmitters are molecules that are used to relay, amplify and modulate signals between a neuron and another cell. In the central nervous system (CNS) the activation of glutamate receptors leads to a phenomenon called excitotoxicity, the main mechanism underlying neuronal death in stroke and anoxic and traumatic brain damage. This latter belongs to an excessive activation of ionotropic glutamate receptors, particularly those of the N-methyl-D-aspartate (NMDA) subtype, leading to a rapid influx of Ca2+. Overstimulation of these receptors, even due to neurotoxins action, leads to cell death. In physiological conditions brain tissue has a relatively high consumption of oxygen and glucose, and its energy production depends almost exclusively on oxidative phosphorylation. Therefore the presence of glutamate in the synapse is regulated by active ATP-dependent transporters in neurones and glia. On the other side a CNS ischaemia involves a restriction of delivering substrates, particularly oxygen and glucose. Such a focal impairment of cerebral blood flow impairs the energetics required to maintain ionic gradients. Consequently, somatodendritic as well as presynaptic voltage-dependent Ca channels become activated and excitatory amino acids are released into the extracellular space. Fig. 2: NMDA flux activation. Excitotoxicity is usually triggered by an influx of calcium due to the binding of glutamate molecules to NMDA-type glutamate receptors. The calcium activates many different cellular pathways of which several are involved in the mediation of cell death. (See Here). The first and the second class of receptors cause rapid excitatory neurotransmission in the CNS by promoting entry of Na+ into neurones. NMDA receptors are associated with a high-conductance Ca2+ channel which in non-depolarising conditions is blocked by Mg2+ in a voltage-dependent manner. 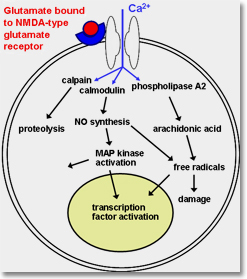 The activation of NMDA receptors, which is secondary to AMPA- or kainate-receptor one, depolarises the neurone, allowing the release of the Mg2+ blockade. Activation of NMDA receptors and metabotropic glutamate receptors contribute to Ca2+ overload, the latter via phospholipase C and Ins(1,4,5) P signalling. Fig. 3: Implications for NMDA receptor (NMDAR) signalling in toxicity. A model for Src Family Kinases (SFKs) in the pathogenesis of ischaemic neuronal cell death. During ischaemia, SFKs associated with NMDARs are activated (SFK-P) and phosphorylate NMDAR subunits or other proteins in the NMDAR complex. The resultant enhancement of Ca2+ entry is postulated as key to engaging intracellular signalling cascades that lead to cell death. Glu, glutamate; Gly, glycine. (Salter et Al.,2004). For instance, Ca2-activated proteolytic enzymes, like calpains, can degrade essential proteins. Moreover, Ca2/calmodulin kinase II (CaM-KII) is activated, and a number of enzymes are phosphorylated and their activity increases. Transcription factors such as c-Fos, c-Jun or c-Myc are also expressed. Furthermore, Ca2-dependent endonucleases can degrade DNA. All these mechanisms, together with enhanced oxidative stress can induce cell death through necrosis as well as apoptosis. An increase in the universal second messenger, Ca2+, is thought to initiate a series of cytoplasmatic and nuclear events that impact the development of tissue damaging it profoundly. Elementary introduciont to excitotoxicity - University of Losanne (Last visited on: May 05, 2009).